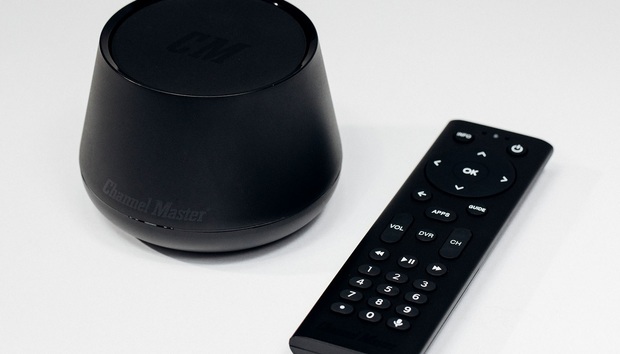 Channel Master is ditching its old over-the-air DVR box and embracing Android TV. The Channel Master Stream+ is a $99 4K streaming box with a coaxial input for hooking up an antenna. It uses Live Channels, an Android TV app developed by Google, to offer a 14-day channel guide and DVR features without subscription fees. Channel Master's executive vice president of product development Joe Bingochea says the Stream+ will replace the company's aging DVR+ product, which offered only bare-bones DVR features and a handful of sluggish streaming apps. Android TV is a more modern platform to build on, offering apps and games from the Google Play Store, Google-powered voice controls, and the ability to act as a Chromecast receiver. For tech specs, the Stream+ has a quad-core CPU, 8GB of storage, 2GB of RAM, 4K HDR video support, 802.11ac Wi-Fi, Bluetooth 4.1, a SPDIF optical audio port, an ethernet jack, a MicroSD card slot, and a USB port. The remote control supports both Bluetooth and infrared, allowing it to control the television's volume and power. Google's Live Channels app handles live TV and recording on the Stream+. Channel Master is taking pre-orders for the Stream+ now and plans to ship the device in mid January. Why this matters: Streaming boxes with integrated antenna support are a rare breed. Roku, Amazon Fire TV, and Apple TV all require a networked tuner (such as Tablo or HDHomeRun) to watch over-the-air channels on their devices, while the Nvidia Shield TV requires an external USB tuner. The Channel Master Stream+ will be the first streaming box for the U.S. market that has a tuner built-in, minimizing the need for additional hardware. Although the Stream+ sounds promising, it'll lack a few key features at launch. To record broadcast TV, users will need a MicroSD card, which tends to be pricier per gigabyte than an external hard drive. Channel Master does plan to support external drives through the Stream+'s USB 3.0 port, but not until it works out some playback issues and other glitches. The Stream+ also doesn't yet work with Google Assistant. Instead, it uses an older, clunkier version of Google voice search that doesn't support direct video playback, smart home controls, or third-party voice skills. Bingochea says an upgrade to Assistant is also on the roadmap. The biggest omission, however, is Netflix. Although the app is technically available on Android TV devices through the Google Play Store, it won't run on the Steam+ until (or unless) Netflix offers its blessing. "They have yet to give us authorization, but we're dying to have it," Bingochea says. In the meantime, Channel Master is hoping that press coverage and positive reviews will help catch Netflix's ear. That may explain, to some extent, the $99 price tag, which Bingochea says is "introductory." The company hasn't set a final price yet, but will decide around mid-January when the hardware begins to ship. "We want to see how that moves the needle, and then go from there," he says.